I just returned from a trip to Kachin State in northern Myanmar where the Burmese Spring has turned bitterly cold. While the world is mostly choosing a narrative on Myanmar (Burma) which is one of an Asian miracle of democratic reforms and growing freedom, the reality in Kachin State is far from it. Here, a 17-y-o. ceasefire with the generals ended in June 2011 when the Burmese Army started an offensive. The fighting has lasted 18 months now and recent weeks have been the worst. The Kachin Indepence Army is mostly equipped with locally made assault rifles and small home-made mortars (which look home-made). The Burmese Army is coming at them with heavy artillery, helicopter gunships and fighter jets. It is an uneven match and with the indiscriminate targeting that the Burmese is so known for, it is one that has already sent more than 100.000 civilians on the run. 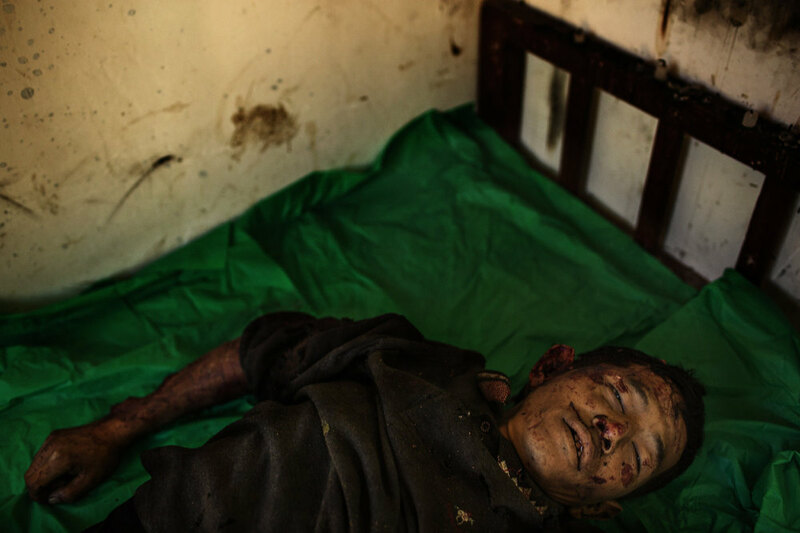 The body of deceased Maji Tu Ja, 40, lies in a mortuary in Laiza Hospital in northern Myanmar. Maji Tu Ja was a farmer and village militiaman who was killed from Burmese Army mortars whilst repairing his tractor in a field. Three other civilians were wounded in the same attack - two of them seriously.